Drop a backpack in a garbage can on a Washington State ferry, and you will shut down the system for hours, as officials evacuate the ship and X-ray the suspicious bag for explosives. So what happens when you leave a 40-foot shipping container, unattended by a highway overpass? 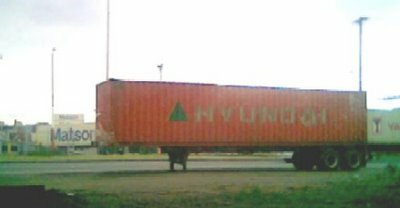 This is a Hyundai container, destined either to or from Terminal 5, but is not going anywhere. There is no semi-tractor in sight, and the container is parked next to the highway 99 overpass, just a few hundred feet from the West Seattle bridge, which are two main highways that connect all of south and west Seattle, to downtown via the Viaduct. I find these things from time to time stretching along the main drags that run through Georgetown. This container is sitting on a patch of gravel across the street from Terminal 25 on East Marginal Way, just a stone’s throw from their gate security office. Perhaps this is the real Port scandal… the 95-percent of containers that go uninspected, and the lax security and lack of accountability throughout our entire shipping and trucking industry? This is something I’ve been talking with people about for a long time. Patty Murray has been harping about it for years, but the Bush administration, with all their professed concern about shaving cream and shoe bombs (and for that matter, illegal immigrants) has done little to nothing. So which is worse? shut down the ferry system for hours? over a gym bag ? ( I am not so sure that would really happen) or to ignore a mysterious container? the downside to rigorous security is that it does stop things up, sometimes terribly, and do you know that the container was not vetted? Why is a parked container any worse than one on a truck? or worse than the thousands that are parked on Harbor Island, Pier 25-30, etc.? Maybe I’m asking too much, but I am hopeful that the new CEO, Tay Yoshitani, will be exhibiting a lot more professionalism than the last CEO. Have you forwarded this picture and your comments to him? He may not even be aware of the issue. Tay handled the so-called severance pay for Dinsmore in a more appropriate manner, I thought, instead of sweeping it under the carpet and ignoring that issue. I’m truly disappointed to miss the public meeting of the Port Commissioners, over the Dinsmore severance pay issue, supposedly scheduled for today, Sunday at 1pm. Turned it on and Channel 22 is down for “scheduled routine maintenance” until Monday at 9:30am. Checked the website, and no schedule is available. Shucks! I want to see everyone’s body language when they unanimously voted it down. I think Pat Davis figured the whole thing had a rank smell emanating that could swirl further around herself. @2 Wrote “So which is worse? shut down the ferry system for hours? over a gym bag ? Every time I hear mention of North Korea’s missile tests, I try to remind anybody who will listen that if the PRK were to ever attack us with a primitive nuke, the delivery vehicle will look much less like a SCUD and much more like the photo published in this article. For all their empty talk about homeland security, the Bushies have consistently opposed spending money on port security. Bush must not be worried about terrorists sneaking a nuclear bomb into an American city in a shipping container (by far the most likely delivery vehicle), because he thinks inspecting 1/2% of the incoming containers is peachy fine. Dec. 4, 2001: Senate Appropriations Committee votes 29-0 in favor of $13.1 billion for homeland security; the next day, Bush threatens to veto it. Dec. 6, 2001: Senate Republicans reduce homeland security funding by $4.6 billion. Dec. 19, 2001: Under pressure from White House, House-Senate conferees eliminate another $200 million of funding for airport security, port security, nuclear facility security, and postal security. June 7, 2002: Senate votes 71-22 for $8.3 billion of homeland security funding; the next day, Bush’s advisors recommend a veto. July 19, 2002: Under White House pressure, homeland security funding is further reduced by cutting money for food security, cyber security, nuclear security, airport security, port security, drinking water security, coordination of police and fire radios, and lab testing to detect chem-bio weapons. Jan. 16, 2003: White House reacts to Democratic efforts to increase homeland security funding by stating, “The Administration strongly opposes amendments to add new extraneous spending.” Later that day, Senate Republicans vote against funds for smallpox vaccine. Jan. 23, 2003: Senate Republicans cut security funding for the FBI, FEMA, INS, TSA, Coast Guard, and National Nuclear Security Administration. Feb. 3, 2003: Bush submits a 2004 budget cutting homeland security funding by nearly 2 percent. Feb. 14, 2003: Senate Democrats request money for smallpox vaccine, police and fire radios, and public transportation security; no Republicans support it. March 21-25, 2003: Republicans defeat 7 amendments to bolster homeland security. April 2, 2003: Senate Republicans reject Democratic amendment to provide $1 billion for port security. April 3, 2003: Republicans reject protection of commercial airliners from shoulder-fired missiles and four other pro-homeland security amendments. June 2003: House Republicans reject Democratic proposal to raise $1 billion for homeland security by reducing tax cuts for 200,000 millionaires by an average of $5,000 each (from $88,000 to $83,000). Source: James Carville, “Had Enough?” (New York: Simon & Schuster, 2003), pp. 41-43. The explosion that brought down the Alfred P. Murrah building was not a nuclear device. . .and was delivered in a vehicle with considerably less payload capacity than what is shown in the picture. The power of ammonium nitrate is not to be discounted. The explosion of the ship Grandcamp in Galveston Harbor in 1947 was interpreted by seismologists to be a nuclear blast.The three ton anchor from the veseel was hurled miles inland. We try to track ammonium. . .but with the clowns we have in charge now. . . In addition, in the last three years I can think of the local theft of two propane tankers. Ask anyone in San Francisco tomorrow morning about the impact of a single errant gasoline tanker. . . . .
Inspecting all incoming containers is a start. Follow this up with bar-code seals with some form of holgraphic security sign. In technical-speak, our landscape is littered with “soft targets”, many of which are also “high value” targets from a terror perspective. When we are given empty rhetoric,but no funding for essentials such as communications fixes for the inability to commun icate demonstrated by police and fire units in NYC on 9-11, we are not well served. The same is true for the non-funding of cargo inspection. Good Police work defeats terrorist activity. . .not illegal and ill considered wars. . .
We are not well served by political apparatchiki like Rove and his ilk concentrating on defeating their political opponents and not focussing on our legitimate enemies. Republicans would rather ban online poker than make the hard choices to protect our ports. It won’t be easy. It will mean less convenience and more costs for the Walmarts of the world as we ship in our $20 DVD players at razor thin margins. Isn’t inertia a wonderful thing? The Republicans love the terrorism issue if they get to bloviate about it all day long, but when it comes to critical governance and competence they are just a bunch of hot air. And Kieth @2, the one container that Goldy points out is not any worse than the thousands parked in the piers. The main issue is that due diligence is not being done on inspecting “all” containers coming in. The problem is one of throughput, I think our economy is so dependent on the rapid flow of cheap imports that nobody wants to do anything that might jepordize the gravy train, ie diminish the throughput. Inspecting 95% of incoming containers is possible, it will just have consequences. And so far our leadership seems more inclined to just take the “hear no evil see no evil” approach. Of which Goldy’s picture is just a symptom. We have an idiotchild President who will walk holding hands with the King of Saudi Arabia. . . who panders to the Wahabist financiers for al Quaeda, and a VP who wants us to support the Sunni sect of Islam, demonstrably the least progressive elements in the muslim world, we have core problems well beyond tracking cargo containers. . . .
@14, Agreed. But this particular problem is about much more than just the president. As much as he wants to be, Bush is not “master of the universe”. The port security is something that needs to be addressed by our legislative leadership, irrespective of the president. I am dismayed by Buscho as much as anybody, but many of the critical problems we face in this country are not even relevant to the presidency. The main problem with Bush is his cynical consolidation of power in an ever enveloping blanket of incompetence. The entire freight import/export industry goes on without security. A thousand containers a day enter the ports of Seattle and Tacoma after spending time parked in un-secured locations and often unlocked. The entire system is trusting ribbon seals which can be replicated. Security at overseas ports is even more lax. The drivers who flip these cans never even see the freight or the loading point and these guys are lucky if they earn minimum wage. None have any kind of background check and many are not even US citizens. It’s in Gregoire’s state, if she thought it was important she’d hire a union thug to go in and haul it away, with a couple of $101 fines tacked on to boot. There are lots of freed felons out now who would be happy to take the trailer and run…Give em a call! Democrats proposed this years ago, but the White House and Republican Congress said no; they had other priorities. Like another round of tax cuts for multi-millionaires. By the way, the highest CEO compensation paid in 2006 was $1.7 billion, to the manager of a hedge fund. A couple of other hedge fund managers got billion-plus paychecks last year, too. With that kind of income now possible in the upper echelons of finance and business, it’s very important to keep those tax cuts coming so they can enjoy that money. Don’t want to undermine incentive, you know. @11 Republicans have plenty of money for billionaire tax cuts, but no money for police and fire radios. Personally, I think their priorities are fucked up. @17 Now there’s an idea! Get out your Republican PCO voter list, call some of your Republican voters, and that trailer will be gone in no time! 20. I’ll bet if it impeded Sound transit 9k per inch snale movement, or Sims, Gregoire or Mayor Greg Billions private Limo treatment it would be gone in a flash! Goldy, you are on the watch on this one. Watching what could happen if there is an unattended 40-foot shipping container looking for an opportunity in this state. We just today watched a natural disaster in San Francisco, when a trailer full of gas collapsed a major bridge access. The Border patrol stopped the last major attack in this region, I hope all of us are aware enough like Goldy to vigantly watch, call out, and stop the next one. (1.) Raise the “threat level” color code (how scared to be when they declare it to be “teal”, or “burnt umber”) prior to elections to try and convince us that if we don’t vote for them, we’re all gonna die. (2.) Take tens of thousands of government employees out of the Civil Service system and screw them out of their benefits. (3.) Stream the appointment of cronies and hacks to cushy high-paying positions. (4.) Funnel money into the coffers of “favored” contractors. Convenience too often trumps security. The aim is to have a violent event, often symbolic in some fashion, that physically impacts a relatively small number of people but because of media coverage will be “felt” by a much larger number.